All Medipedia users are given individual accounts with specific rights and access to enable them to get the most out of the platform. There are multiple types of accounts which are created for specific user type. For instance, medical consumer accounts are alloted with different rights than medical provider accounts. These rights and abilities of different users of the Medipedia platform define different functionalities of the platform itself. Let’s discuss in detail. The Medipedia project was started with the purpose to connect medical consumers seeking information with the right services providers who can assist them in a particular situation. It is crucial that the platform has all the right elements (members) which include medical consumers, service providers, and external parties like pharmaceutical companies. It was, therefore, important that separate accounts with different rights and functionalities are created for different types of users. The technical base of all types of accounts are the same, but they differ in terms of right and functionalities based on the roles of different users in the system. 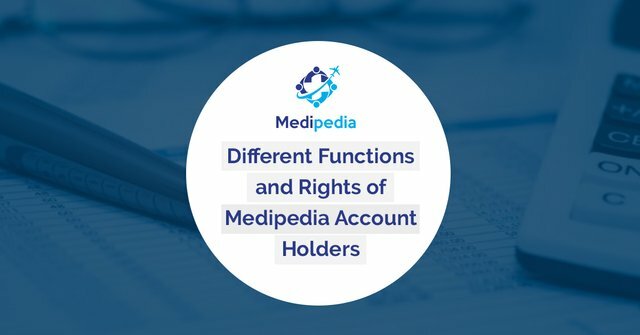 Here’s a detailed description of the various types of accounts in the Medipedia ecosystem and their roles and responsibilities. To sum up, a medical consumer can add, edit or read his/her own personal information and can access general medical information, such as hospital and doctor details, but they cannot access personal medical information of other users. A medical provider (doctor or institution) can read and update medical information of consumers only when allowed to do so and for medical services purpose only. They can add and change general medical information at any time. External participants like pharmaceutical companies can access patient records only when allowed. They can also add or update medical service information on the platform. As you can see, Medipedia participants can never access the personal information of others users in any case. This is to protect the privacy of the platform users and to ensure that the system remains as transparent as possible. A medical provider can, however, request the personal information of a medical consumer only when the medical service is requested by the consumer.